Are there any WYSIWYG editors for PGF/TikZ? Perhaps something similar to LyX but for PGF/TikZ? If there is no WYSIWYG editor for this tandem, is there one perhaps that allows the user to easily generate PGF/TikZ templates? Alternatively, how can I most easily generate PFG/TikZ code from a visual conception? Do people mostly code their PGF/TikZ graphics from scratch? There is ktikz (also available in the qtikz version), which seems not only run on Linux/KDE but also on Windows. Version 0.10 is released. This version is available as an Ubuntu package for Lucid, as a Debian package for Squeeze and as a Windows installer (a patch release 0.10.1 is available). For Linux there are two versions available: KtikZ and QtikZ. KtikZ is integrated with the KDE4 platform, whereas QtikZ has the traditional Qt-only interface. I personally use latexmk -pdf -pvc to keep recompiling my TikZ diagram file after every saved edit. I use a dedicated file for every diagram which uses the standalone class (which I wrote just for this very purpose). If you use a PDF viewer with auto-reload like evince then the changes are shown directly (after each save). I had issues getting latexmk reloading PDFs in the Adobe Reader. Geogebra is a geometry software that can export nice TikZ code. Dia is a diagram design software that exports Pgf code. A full list of this can be found in the TeXample page. As Martin Scharrer said, there is also kTikZ/QtikZ which compiles TikZ code in realtime and previews it in a window. It works under KDE and also in Windows. May be Tikzedt (works on windows and linux) is what you are looking for. TikZ/PGF is a pair of widely used languages for creating vector graphics, in particular in Latex documents. There are a couple of editors assisting in the creation of TikZ code. However, mostly one has the choice between a text editor with preview, with no WYSIWYG capabilities, and a true WYSIWYG editor with a TikZ export function, without direct code access. Combining both direct code editing and WYSIWYG features is quite involved, since it requires a parser and interpreter that "understands" the TikZ code so that it can be rendered and edited in a WYSIWYG manner. We recently wrote such an editor, TikzEdt. This article describes the main programming challenges we faced, and design decisions we made to overcome them. Furthermore, there are some components of our program that can be reused for similar applications. I needed a simple graph editor, so finally I rolled my own since I wasn't satisfied with all the solutions. They probably work great for use cases like complicated diagrams, but it took me too long to draw simple graphs (and I needed to draw a lot of them). You can test the latest version at http://marko.ristin.net/zeichne_tikz and the repository can be found at https://bitbucket.org/markoristin/zeichne_tikz. The editor you're looking for is TpX. It doesn't seem to have been worked on in awhile but I use it all the time and it's really great. It exports a file with it's internal information appearing as % comments for TeX with tikz code beneath - it will even enclose it in a figure environment, so you just include the .tpx file and the LaTeX compiler does the rest. The ktikz / qtikz option mentioned by Martin Scharrer is excellent in my opinion. Similar functionality on OSX can be obtained with Fredokun's Tikz Editor. Neither is truly wysiwyg because you still have to write the code, but having a real time preview is a great help in learning the language. Another tool in this category is TikZit. 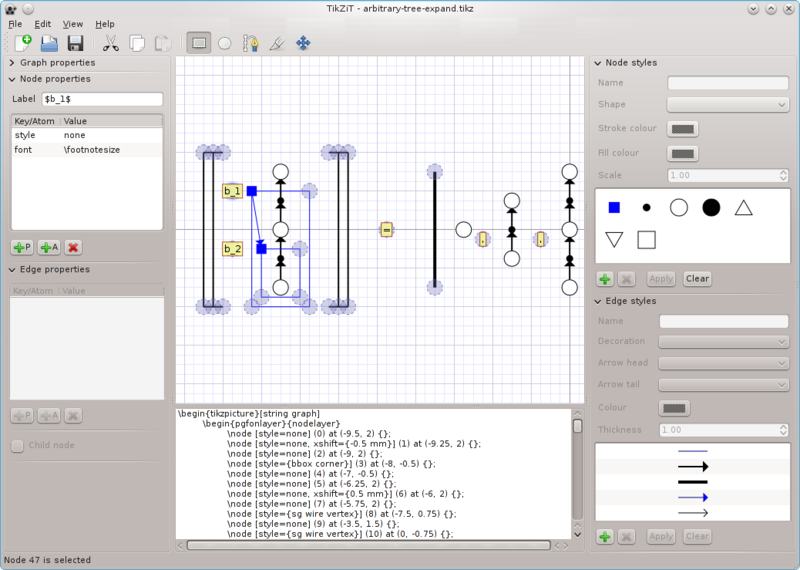 TikZiT is a graphical tool for rapidly creating an editing node-and-edge style graphs. It was originally created to aid in the typesetting of "dot" diagrams of interacting quantum observables (see arXiv:0906.4725), but can be used as a general graph editing program. Not the answer you're looking for? Browse other questions tagged tikz-pgf editors or ask your own question. Is there any solid WYSIWYG editor for Tikz? What GUI applications are there to assist in generating graphics for TeX? Is there any tool to draw bezier curve and transfer the coordinates to tikz? Getting a live preview of TeX (on Windows) - for just a small snippet of code? Is LaTeX the best option? Producing TikZ-made .pdfs and using /includegraphics on them? General processing instructions for TeX editors?